The Taino names of the Caribbean islands based on Jalil Sued-Badillo (ed. ), ‘General History of the Caribbean, vol. 1: Autochthonous Societies’ (Paris: UNESCO Publishing/London: Macmillan 2003) Plate 8. Was there a single name all of the Caribs (Kalinagos) were known by? As a regional group? I spoke to a Kalinago in Dominica and he gave me the impression there were group names depending on where they were – NE south america, central america, SE north america, Caribbean. 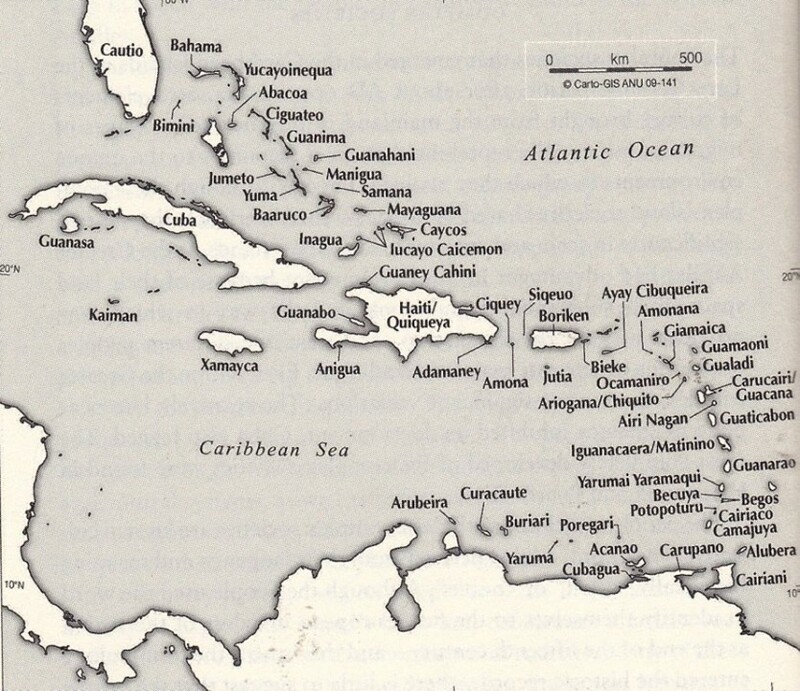 I am looking for a single “tribe” name for the islands of whatt we now call the Caribbean Basin – from Cuba south-east to Trinidad inclusive. Sorry ’bout that, I must be getting old… did they all claim to be tribes within the Taino? Is “Taino” what I am looking for? No, there wasn’t one collective name. It would be like grouping all the Indigenous of any nation into one name. “Quisqueya” is not a taino word, the word was invented by Pedro Mártir de Anglería around 1500s. Where did he hear that word? Isn’t Cuba’s full original indigenous name “Cubanacan”? A muchas personas cuando se mudan a US u otros paises, les encanta que le cambien su nombre. Yo naci en el Caribe, por que no ser Carobeño? De donde sale el apodo “latino” o “hispano”( tengo idea). Pero por 26 años que vivi en US, nunca me considere ninguna. No permito ser nombrado con lo que no soy y/o comparto. excellent reading…..los caribises…the most warrior tribe of the islands named after them…and the sea..are from this tribe that not only battled against spanish blood n gold thirsty dogs…..but battled even the vikings that went by breifly…the caribises ….now known as caribs….were not small in size nor vegitarians like the tainos n arawaks….guanahatabeyes..
were mixed indigenous peoe with the afrijan slaves that were brought in to the islands…after the conquistadors killed most of the men……and yes the conquistadors were of afrikan..muslims….moorish decendants….from spain…..
Would like to know more. This is very interesting. St. Thomas and St. John had no name then according to this map…. The poeple of Ayti a.k.a Quizqueia are still here, as we are what we are: Autochtones people (copper-tones) of one of the Atlan islands and the 2 lands (The Americas). El autor del comentario hizo la distinción cuando explicó que en el caso de ‘Mona’, el guano era de murciélagos. Queriendo significar que no era de aves. Gua is a very common prefix in Taino language and many Spanish words borrowed from Taino have it. Its very common use today in Quiqueya and Boriken (that I know from personal experience). We need to know the original peoples of the Caribbean. This type of information helps sensitise our modern natives to the genocide that occurred following 1492. Some of the Taino island names are similar to island names of today. I realize quite a few of the names begin with “Gua,” I wonder why. Not the taíno idiom is Arawar. In Puerto Rico we have towns named Guaynabo, Guayana and Guaraguao. Do you know the origin of those names? Y un municipio que se llama Guayama. theres also personal names with Gua..in quiqueya for example, guarionex and guacanagarix…those were taino heros, there is also guarino, guariboa and some others…..and in present days, guarionex and guarino are names that are still in use. it was thanks to the good ‘conquistadors’ and monks and priests who preserved and recorded the Taino names and traditions since the indigenous peoples had not evolved into a written language. As in all things throughout history , there were many good people who tried to do good.